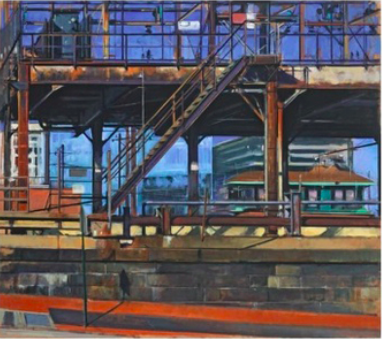 How does an artist capture enigmatic "Cityscapes" of Washington, DC? On the evening of May 22, I visited Hemphill Gallery to see the current exhibit of work that spanned more than three decades by artist Martin Kotler. That same night George Hemphill introduced another art form in the gallery -- Afghani music of Massed Omari & Abigail Adams Greenway "Tabla for Two." The meditative, classically Punjab, spiritually inspired sounds from nature resonated with the visual sensations. Kotler’s canvases are not simply a photograph rendered in oil paints. They are thoughtfully composed observations shaped by influences from both classical and modern art. Kotler is an artist that takes a different look at things than other contemporary artists. He depends fully on the subject he sees. The curiosities and emotions he feels drive his desire to compose, draw, paint and express. Kotler describes his observations in an interview with George Hemphill. Kotler sees dramatic changes to the city’s waterfront and beyond, from high plateaus and on the streets. For him "development is always a part of change, it is a sign of health for any city and it allows to see anew." Kotler intuitively documents his artistic interpretations and "momentary sensation, or aberration that, like an ‘addiction,’ drives an artist to expand the visual sensation into a fully understood composition." "Kotler's cityscapes stem from the western cityscape tradition that descends from Ambrogio Lorenzetti in fourteenth century Sienna, the seventeenth century Dutch, eighteenth century Venetians, nineteenth century French painters Corot, Boudin and Seurat to twentieth century interpreters such as Sheeler, Demuth and Diebenkorn. The masters with whom Kotler shares a particular affinity are Pieter Saenredam and J-B-C Carot. Kotler's interest in illustrative content has been for him both a liberation and stimulus--a point of departure for his own dynamic experiments as it was for his forebears. He confidently integrates the lessons of his predecessors and masterfully transforms the district's architecture, streets, skyline and train yards, often in series, into new distinctive pictorial themes. His sustained inspiration from the quotidian world is diversified and animated by means of intricate harmonies of color, light, textures of varying densities – all situated within his own spatial frameworks. These uniquely personal compositions express and incorporate the artist's command of perspective and detail. Kotler extracts newly invented picture ideas by means of the creative geometry he imposes. His striking and original reorganizations prompt us to look beneath the mere surface, the immediately accessible, and seek out the manifold complexities of his investigative ideas," explains Richard Wattenmaker, retired director of Smithsonian Institution Archives of American Art, in his essay for Kotler's exhibit catalog. "Invariable throughout Kotler’s career is his love for a city that continually rewards him with infinite possibilities. The street scenes, panoramic vistas and canal portraits exhibited in Cityscapes reveal the diverse landscape of Washington’s few square miles. The paintings emit a tangible warmth as a result of not only Kotler’s love for his muse, but his love for the process of painting itself." Hemphill Gallery’s press release notes Kotlers’ intimate connection with his landscapes. The exhibit was a rare collection and extraordinary experience, especially that evening with the meditative sound of Tabla for Two. Martin's landscapes of Washington, DC define the enigma of our ever-changing panorama. I encourage you to take the time to see Washington through this lens.